Shopping for the pecan lover on your list? Find the right gift sure to please anyone with our pecan gift baskets, gourmet pecan samplers or any of our other great gift ideas. 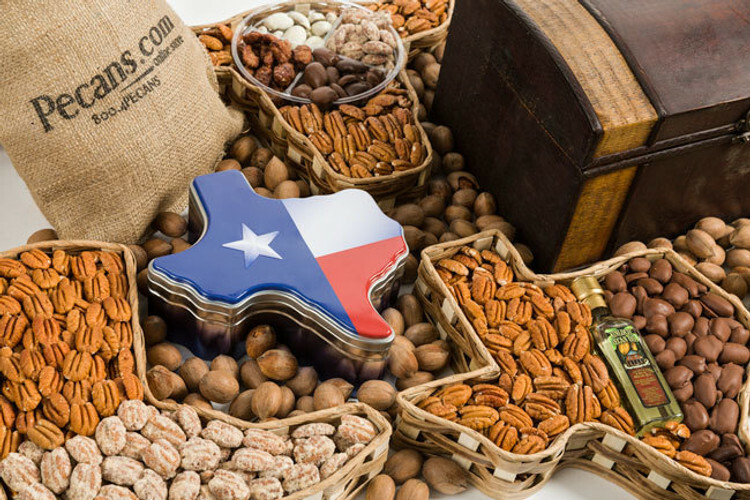 Choose from our assortment of Texas pecan baskets, available with one pound of our freshest fancy pecan halves and your choice of dark or white chocolate coated pecans. Don’t have time to cook? We’ve got you covered with any of our delicious pecan pies, crunchy pecan brittle or pralines. From nut crackers, cookbooks and fudge, to gift baskets samplers and pies, Pecans.com has something for everyone. Perfect for birthdays, holidays, corporate gifts or treating yourself! Not sure which delicious Pecans.com product to get? Send a Gift Certificate instead!